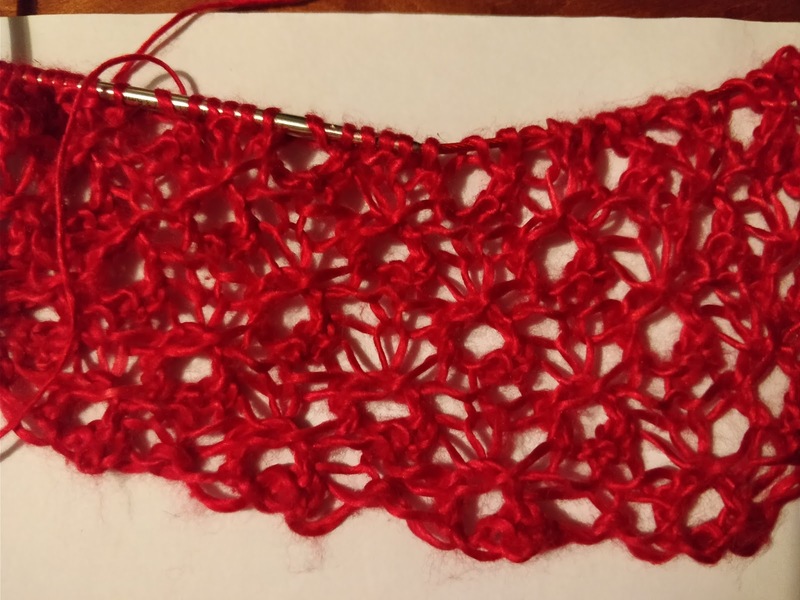 Yesterday I cast on for a new shawl, from Victorian Lace Today. It will be the first pattern from that book that I've knitted for myself. 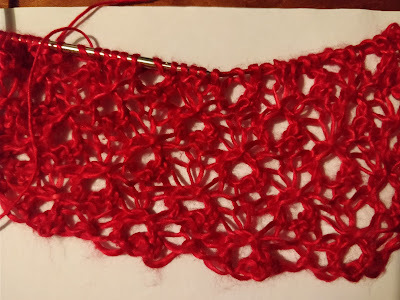 I got through 12 rows at knitting group before realising that the mistakes I had made were not fixable by tinking and, although nobody else would have noticed, I would always have known that that fourth row of circles had a strike across the middle as though they were zeroes. I've been working on it again today, having ripped back and cast on while still at knitting group. Row 1 is not fun: trying to K3tog on a cast on row is just maddening; doing it for the second time made it easier because I cast on very loosely. The gorgeous confection is Artisan pure silk laceweight, dyed with cochineal and a tin mordaunt (I am repeating this straight from the label without a strong understanding of what I mean....how can a metal be used as a fixative?) I've written on Ravelry that I got it in 2009, at UK Rav Day, but I bought a purple one then and the red one later, possibly at Fibrefest. For some reason I never wrote about Fibrefest on my blog, so I can't be sure, but I definitely didn't get it at Wonderwool and I can't think where else it might have come from. I might use the purple for the border, but will see how I feel when I get there. I've also been blocking last weekend's FO. It has come out predictably large.